You are a high school student. You really like geography class and spending time with an atlas. 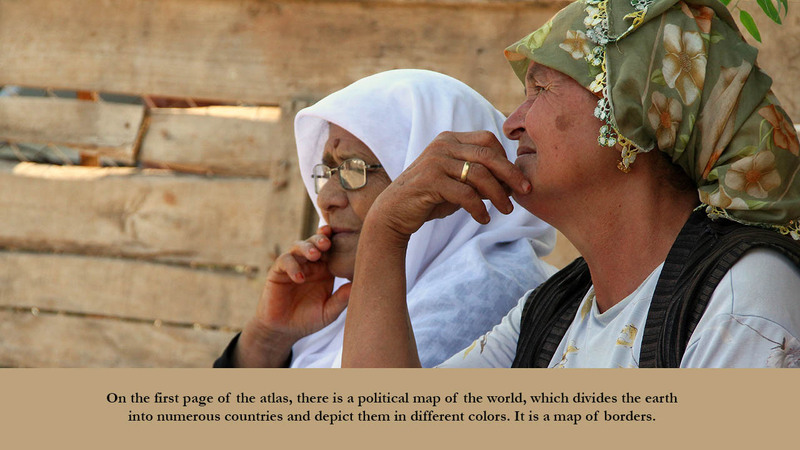 On the first page of the atlas, there is a political map of the world, which divides the earth into numerous countries and depict them in different colors. It is a map of borders. The lines are sometimes so straight that you think they are drawn with a ruler. At the very center of the map, you see Turkey. You liken Turkey, your beloved country, to a heart in the middle of the body. Every inch of its territory belongs to a sacred country. But no sacred places are sheltered from enemies. You never forget the saying that “Turkey’s three sides are encircled with seas, while four sides are encircled with enemies.” You have to be watchful and attentive with respect to Turkey’s enemies – to protect the heritage of your ancestors. Your ancestors had to fight against yedi düvel (seven great powers) and left this soil to you. Your nation is special. As you check the map of Turkey, you see how beautiful Turkey is located at the center of the world. The only unfortunate thing is that the small islands, just a few miles away from Turkey, belong to Greece. There is something wrong with that. You are a young man and really like to travel the world, often in the form of business trips. On each international flight, for a moment, you imagine the countries in different colors when looking from above. You picture the borders drawn in a bold font. But what you see are only snow-capped mountains, slithering rivers, bluish seas and oceans, and eerie deserts. 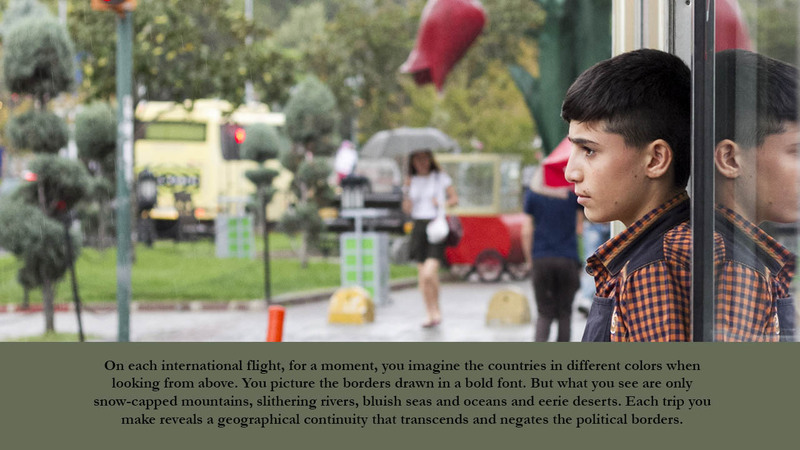 Each trip you make reveals a geographical continuity that transcends and negates the political borders. The continuity also applies to people. 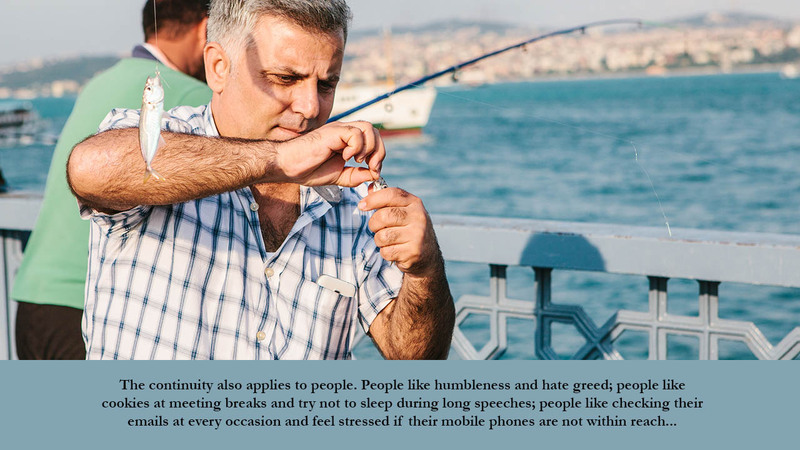 People like humbleness and hate greed; people like cookies at meeting breaks and try not to sleep during long speeches; people like checking their emails at every occasion and feel stressed if their mobile phones are not within reach; people want to be liked on social media and wonder who visits them; people fear being alone but remain so to the end. You draw the conclusion that people are in essence the same, which causes daunting doubt to enter your head: If people are so alike, how can your nation have superior traits to others? You are middle-aged and flying from Greece to Turkey. You are a business class passenger because economy is overbooked, and the airline upgrades you. The cabin crew does its best to make you feel like an important person. You get juice as you sit on your showy seat that suggests you’re in a spaceship cabin, and then you are served various appetizers followed by grilled salmon. You are charmed by the ambiance and round out the scene by adopting an arrogant attitude as if you are the owner of the airline. You take off your jacket but keep your tie on, put your iPad in your classy leather case and ask for Le Monde from the crew. You know that reading a French newspaper is cooler than an English one, not to mention Turkish newspapers. You remember the headline of the day “Migrants: Comment mettre fin à l’hécatombe?” You feel sorry for the people who risked their own lives as well as their family’s to pass across the Mediterranean. You knew Syrians who fled from internal strife to Turkey and try to escape to Greece, often via primitive boats. In the tiny news titles, you can see reports on refugee corpses washing ashore in Turkey or on Greek islands. Even if they survive the Mediterranean, the rest of the journey is laden with belirsizlikler: Living in the adverse conditions of refugee camps, treated as unwelcome foreigners by the local people, and deceived by human smugglers at every stage. For you, it doesn’t make much sense to plunge into such belirsizlik where you risk the lives and futures of yourself and your beloved. You feel pity for the people of poor countries and quite comfortable about your own future where the belirsizlik could be only in minor matters. At some point, you take a look at the Mediterranean Sea which is shining thousands of feet below. It is glamorously blue, and no spots are visible in it. You fold up the newspaper with its universally distressing news and decided to read the book you bought at the airport before take-off. It is Paul Auster’s Winter Journal in which he has composed an autobiography where he calls himself “you.” His literary style is impressive, and you keep reading until the pilot announces that the plane is descending to land. You put the book back into the leather case, and take a final look at the sea. Then you murmur all quiet on the Mediterranean. You have no idea that your complacency is based on an arrogance which the Titanic operators once had. Not long after your last flight travel, things start to change at an unprecedented pace in Turkey. 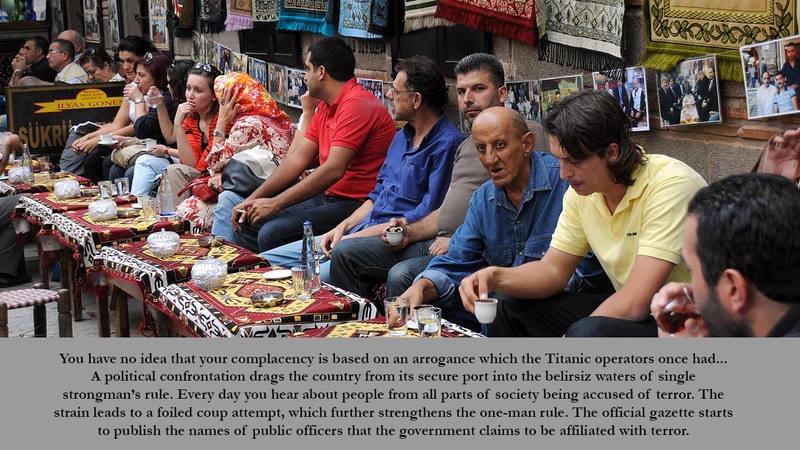 A political confrontation drags the country from its secure port into the belirsiz waters of single strongman’s rule. Every day you hear about people from all parts of society being accused of terror. The strain leads to a foiled coup attempt, which further strengthens the one-man rule. The official gazette starts to publish the names of public officers that the government claims to be affiliated with terror. In each announcement by the official gazette, people rush to the website to check if their name is on the list as well. And one night, while checking the table of so-called terror-affiliated people, you find your name along with tens of thousands of others. It is just a name in a long excel table – one single name among more than a hundred thousand people. But for you, this is the end of the life you have known so far. You lose your job and are prevented from getting a new one. You can’t benefit from general insurance. Your passport is canceled, and you are not given a new one. 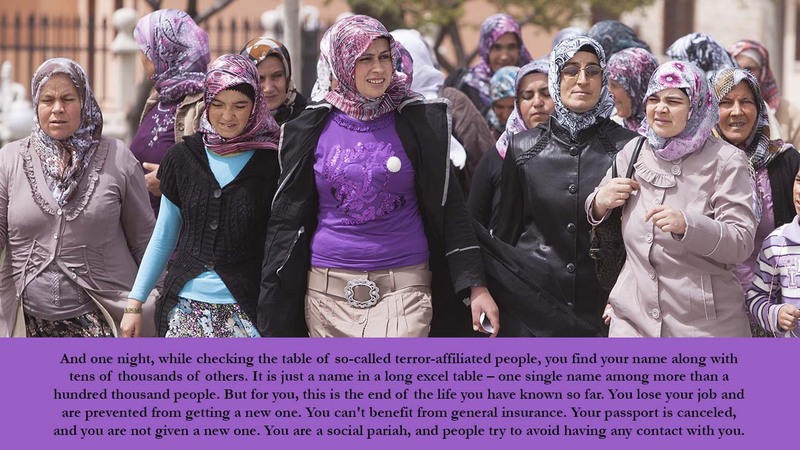 You are a social pariah, and people try to avoid having any contact with you. In the middle of your life, while you have been motivated to protect your country against the “enemies on four sides,” you turn out to be an enemy of the state one night. The only asset left to you is your foreign language skills, and you start to work as a freelancer. You move to a cheaper apartment and change your spending habits. After some time, you get used to this new situation and even like to work independently from an office. You have no idea when this is going to end. Your future is completely belirsiz. 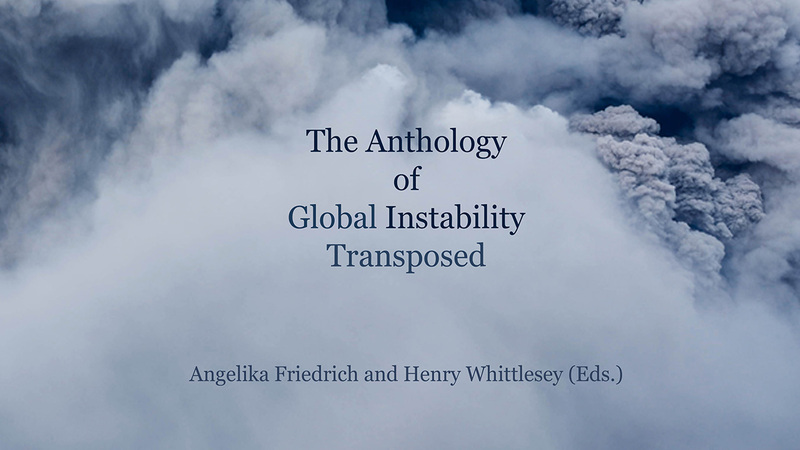 At one point, you write a short story on “instability” for a foreign agency. They tell you to compose a similar one on belirsizlik for the next year and would like to work with you again. Although you say “it will be a pleasure for me,” you think this crazy period in Turkey will come to an end and you will get back your old job in a year. However, things get even worse. The police start to raid the homes of those on the terror-list which covers hundred of thousands of people regardless of age, gender occupation, etc. Your friends, your relatives are taken into the custody with trumped-up charges. Every day you see news on people who are escaping from persecution by fleeing to Greece. Some make it; some are caught by the navy; and some perish. You want to let the world know that not all is quiet on the Mediterranean. But your voice is extremely weak. One night, you cannot sleep because you feel so helpless and hopeless for yourself, your family and your beloved country. In this depressive mode, you hug your wife in bed and suddenly remember Stefan Zweig who ended his life in his wife’s arms during his self-imposed exile in South America, away from the atrocities of World War II in Europe. However, you think that if he had persevered just a few years more, he would have seen the end of the bloodshed, and not died with so much gloom. You realize there is hope and reason to thank God, as you can still hug your wife, but not a pillow. Then you get out of bed, find an old high school atlas on the dusty bookshelves, open your computer and start to write an essay on belirsizlik. As you finish your story, you return to the atlas. On the second page of the atlas there is a map of the world where you see glaciers at the edges, oceans in a variety of blues, forests and savannas depicted in green, deserts scattered in pale yellow, and mountainous areas often in dark brown. You are amazed at how tiny pieces of land connect colossal continents, like the Sinai Peninsula between Africa and Asia and the Isthmus of Panama between North and South America. The whole Black Sea opens to the Mediterranean through two narrow straits, the Bosporus, and the Mediterranean opens to the Atlantic Ocean at the gate of Gibraltar. The mountain belts are also astounding: You can see how the Alpine belt stretches along southern Eurasia, including the Pyrenees, Alps, Taurus, towards South Asia and the Hindi Kush, Java and Sumatra. 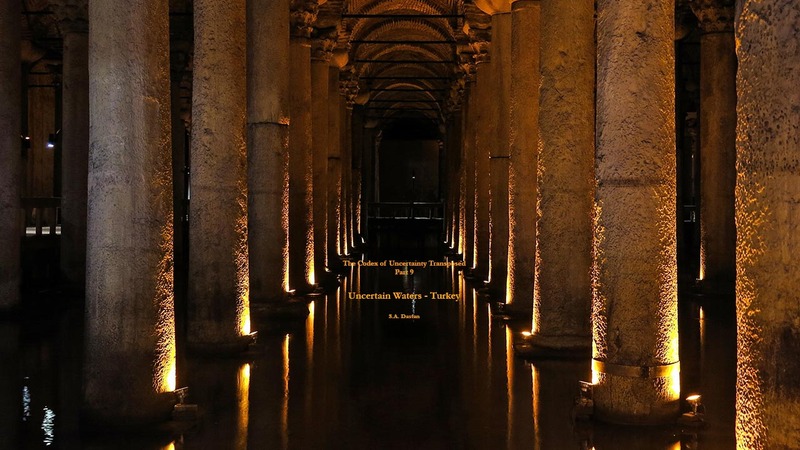 The rivers, like the Nile and Danube, traverse thousands of miles before reaching the seas. 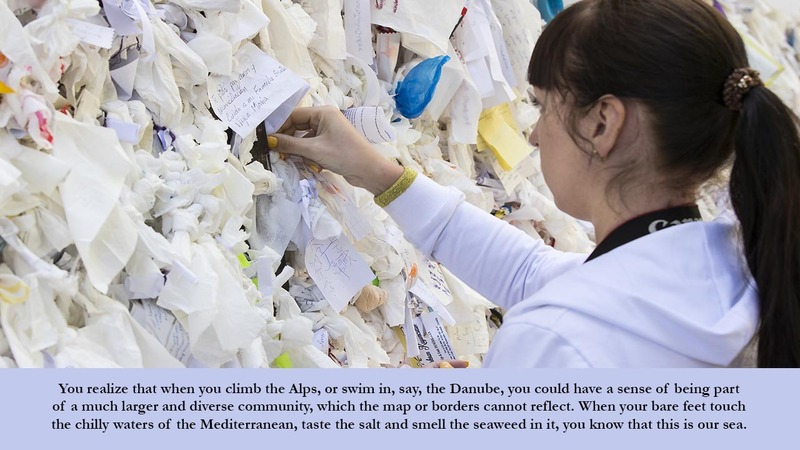 You realize that when you climb the Alps, or swim in, say, the Danube, you could have a sense of being part of a much larger and diverse community, which the map or borders cannot reflect. When your bare feet touch the chilly waters of the Mediterranean, taste the salt and smell the seaweed in it, you know that this is our sea. And while you are thinking about these things, you check the location of your country and see that there are belirsiz waters between Turkey and the small Greek islands. You are sorry that these islands are not so close to Turkey.